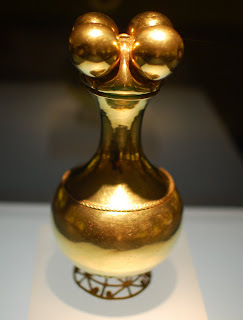 This is a fancy flask for lime (calcium hydroxide), seen at the Gold Museum in Bogota. Coca leaves are usually chewed with lime, as its basic pH aids in liberating the alkaloids from the leaf. Modern betel nut consumers use lime for the same purpose, though they haven't yet crafted such a fine container for their lime.